Ocean Party with Jumping Dolphins Cake for Kayden’s 8th. July 2007. This was a fun-filled slumber party with many ocean themed activities. 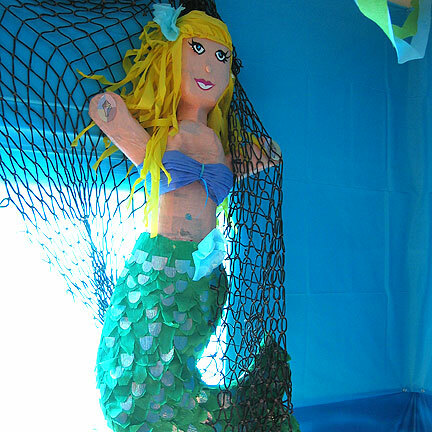 Started with a Mermaid pinata from a local Mexican grocery store that has a great selection of unusual shapes. Dressed her up a bit using sparkling metallic wrapping paper and clip art facial features. Shop for Unique Nautical Gifts and Decor. 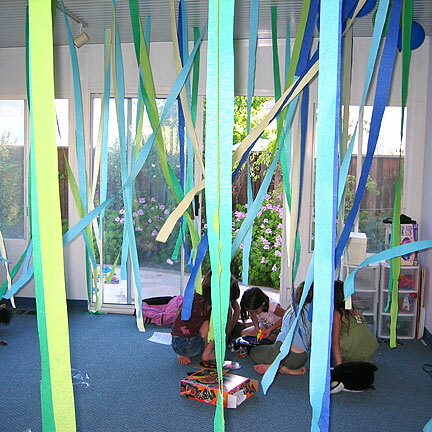 Tape multi-colored blue, green and yellow crepe paper streamers to the ceiling of the room the kids will be sleeping in (for slumber parties) or in a play room. Open the window or turn on a ceiling fan so the kelp can sway and move in the “currents”. Let the kids know they will be sleeping in the kelp bed! 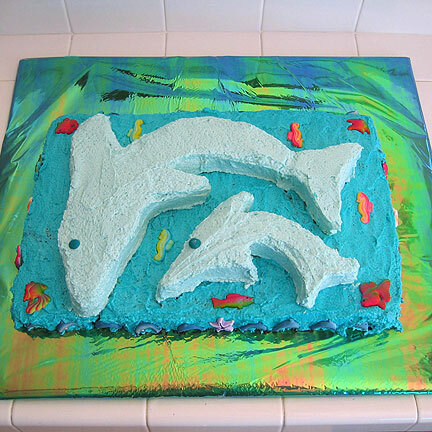 I created a 3D dolphin cake with raised mother and calf dolphins jumping over the waves. 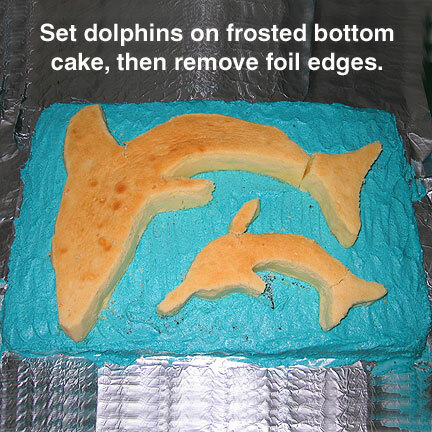 Click on Dolphin Cake Instructions for cake making directions and pattern pieces. Using bread dough such as Bridgeford, let dough rise according to directions. Punch down. Shape bread dough into fish shaped blanks and pre-cook for 10 minutes. Have each child decorate their fish with pizza sauce, pesto, cheese, pepperoni, and any other favorite ingredients. Bake an additional 10 minutes and serve. Created treasure hunt clip art “clues” from Microsoft Clip Art Galleryand various photos of sea animals. Place clip art pictures around the house and yard that hold clues on the back. Clues indicate location of next clue. We had about 30 clues for this age group. 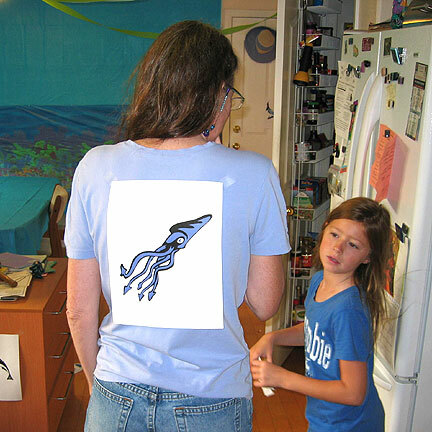 Be sure to put out decoy pictures as well to mix things up or add text clues such as Octopus when you have more than one octopus picture up on the walls. Wear out the kids by alternating clues inside and outside, upstairs and downstairs. Created “clues” from clip art and photos of ocean animals. Hide prizes for all the kids in the final location – we used a bread drawer this time, but a washing machine is also a good hiding place for prizes. We stashed the party favor bags plus some dolphin squirt guns they could play with as the party wound down. I even taped one roaming clue taped to my back! My husband caught a photo of Kayden just at the moment she found of it. 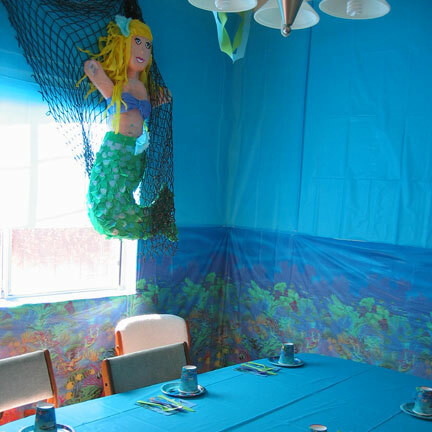 The Ocean Party came to life with a Mermaid pinata “caught” in a real fish net, turquoise tablecloth pinned to the wall, and a sea life scene tablecloth taped to the lower portion of the wall. Strung blue and green colored streamers from the ceiling. After covering the table with turquoise tablecloth, we added ocean themed party supplies such as cups, napkins and plates, plus flatware in blues and greens. We covered the chairs with blue and green felt. Inexpensive felt yardage is available at fabric stores. We even had dolphin switch plates on the walls. Decorated the kitchen walls with an ocean scene imprinted plastic table cover and a turquoise plastic table cover above it. Drew paper fish and used clip art for the finishing touches. Hung up a real fish net and “caught” the mermaid in it. Water Balloon Races: Mark a course with chalk or orange cones before the fun begins. Have kids race by running a course with water balloonsalternately tucked under their chins, under their arms and between their legs. Kids can’t touch the balloons with their hands. If the balloon falls and breaks, you’re out. If it survives, pick it up and keep going. Big Hit! Sand Castle Pit: Fill a 4′ round hard plastic kids swimming pool with sand. Add water and supply buckets, spoons and cups as sand castlebuilding tools. Keeps children who are not participating in other events entertained. All the kids enjoyed playing pin the tail on the dolphin – traditional with a twist. 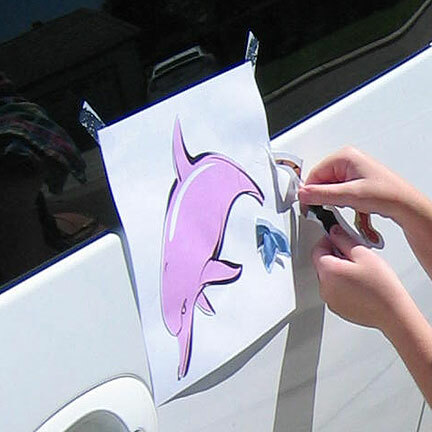 Used Dolphin clip art but mixed things up by using tails from all sorts of animals – mermaid, tiger, horse, whale, peacock, dragon, etc., for the kids to try to place in the correct spot. Very funny results! If you’d like to see our pet and wildlife themed gifts and decor, go to Creative Animal Gifts where we have unique ideas for more than 40 creatures. Categories include Dolphins, Mermaids, Tropical Fish, Sea Turtlesand Whales. Unique Yin Yang birthday cake, giant panda pinata and bamboo decorations for Kayden’s 5th birthday. March 2004. 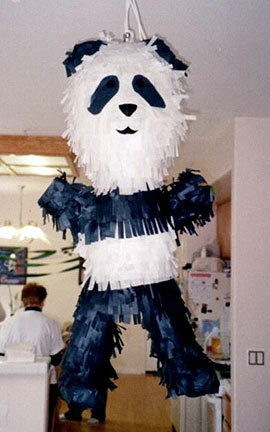 I created a giant panda pinata by transforming a lion pinata purchased from a local Mexican grocery store. (They usually have an extensive choice of pinatas from which to work.) Starting with packages of black and white tissue, I sliced folded lengths of tissue paper using my fringe template from my sewing supplies. I glued these on with glue stick and then added black construction paper eyes, mouth and nose. Bake 2 cakes – one white, one chocolate. Switch layers, with chocolate on the bottom and white on the top. 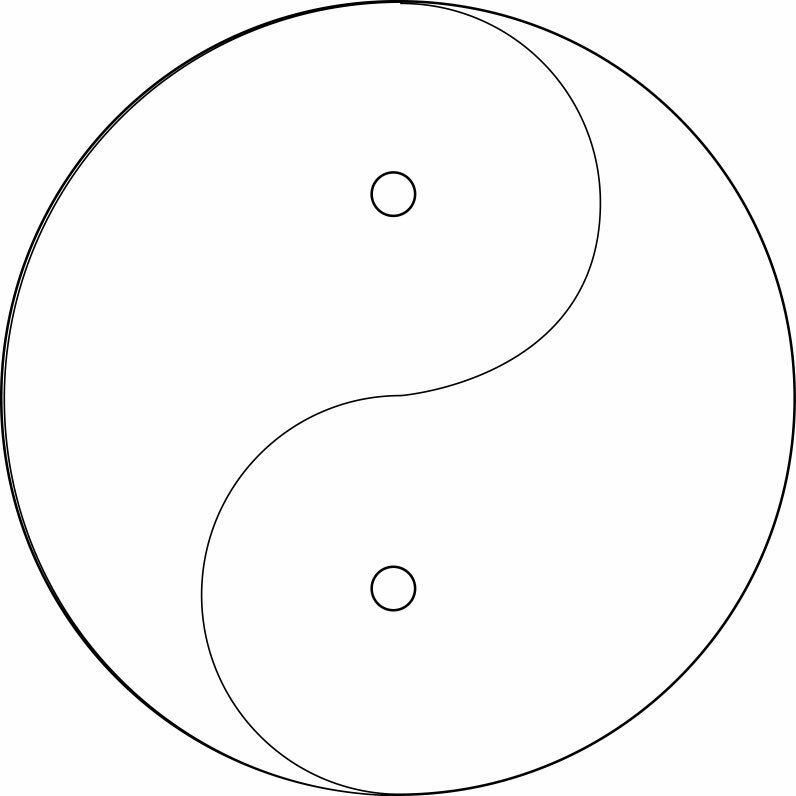 To create the curve of the yin yang design, fold up a 15″ long piece of aluminum foil (Reynold’s Release foil works great for this) until it is only about 1″ high to create a 15″ x 1″ piece of stiff aluminum that will hold its shape. Use the Yin Yang pattern (at bottom of this page) to bend the aluminum into the correct “S” curve shape. Grease aluminum strip, then bend to fit pattern. Lay on top of cake. Frost one side with white frosting, the other with dark chocolate, pushing it right up to foil pattern. When done, remove foil, then gently push frosting together along seam line. For dots, use black and white M&Ms or mints. I used the York mints and just frosted the top of one with white. 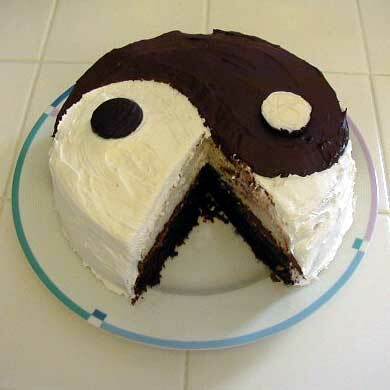 Scroll to bottom for free printable yin yang cake pattern. This is a very popular activity. We had a treasure hunt with black and white animal pictures (zebras, cats, dogs, skunks, tigers, etc., and of course lots of pandas). 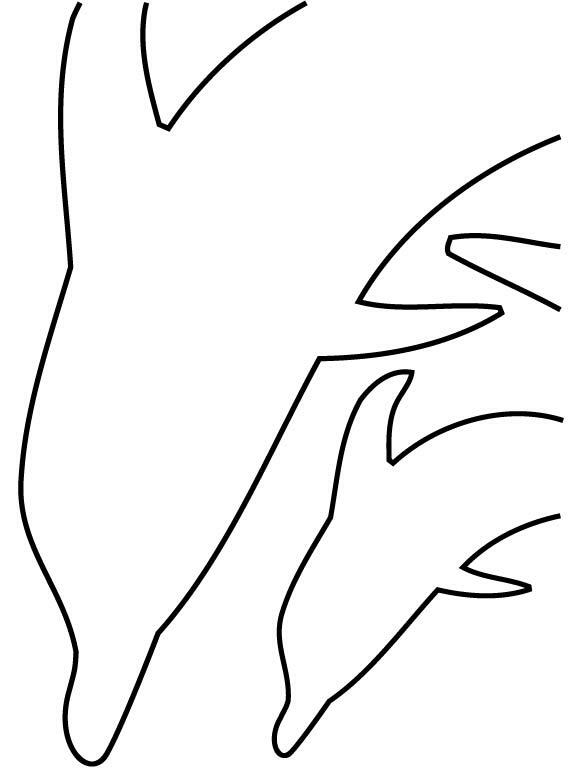 Download images or photos (there are many good free clip art sites) of the animals and print both a small clue-sized version of each one you plan to use in addition to a large one. Fold up a small clue and tape it behind the next large picture. Tape up the large pictures around the house and yard. (Be sure to add false clues so they can’t skip ahead.) I recommend writing down the clue list and numbering each one so you are sure to keep them in the right order. Set aside the starting small clue to give them at the start of the game. The prise at the end consisted of inexpensive stuffed panda beanie baby-like toys that we’d found. (The dryer is a always a good hiding place for the treasure.) The kid’s even enjoyed re-hiding the clues afterward for more fun on their own. 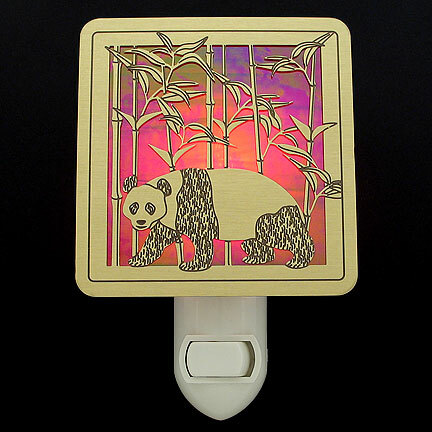 Surprise the birthday girl or birthday boy with a keepsake gift from his or her panda party – this Panda Night Light from Kyle Design is sure to make a memorable keepsake from this themed party. 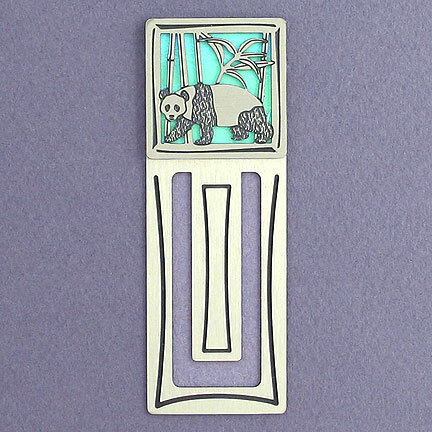 Shop other unique panda gifts for other gift ideas. Send each of your child’s friends home with a personalized panda party favor bookmark – available in different colors for each party guest. Monkey Birthday Cake with Arms, Legs and Tail! I decided to try making my own monkey cake after attending a party with a simple store-bought one. When I went looking for monkey cake ideas, all the examples I found just featured monkey heads. 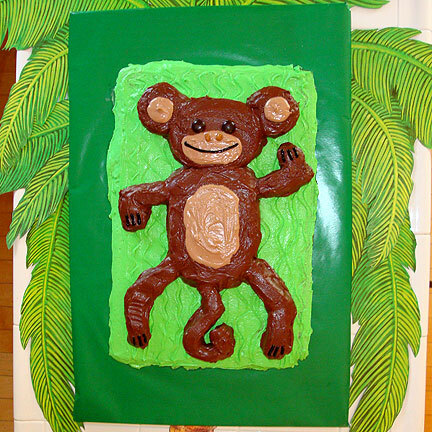 So I decided to create a monkey cake with a full-body raised monkey dancing in the jungle. Your kids will really appreciate your making a special cake just for them. Really, it is not that much work and it will mean so much more than just buying a cake at the store. 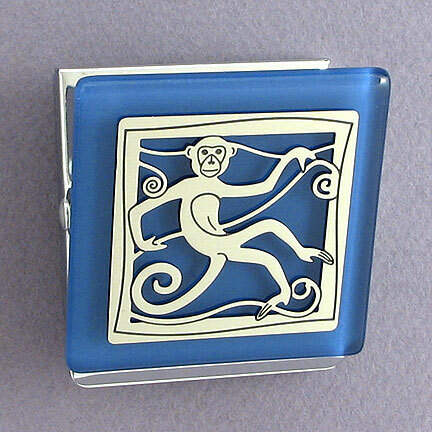 Visit Unique Monkey Gifts and Favors for many fun ideas – monkey night lights for kid’s bedroom, monkey jewelry boxes, monkey earrings and more. Display Platter: Create a display plate by covering a piece of cardboard with wrapping paper. Have ready to go when cake comes out of the oven. Cake Batter: I used three batches of cake to make this one. I make my cakes from scratch which really doesn’t take much longer than box mixes and you can avoid the trans fat that way. There are recipes on the box of cake flour. 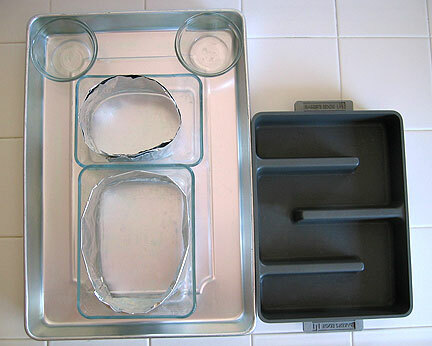 Cake Body: Create your own parts by placing foil forms inside another baking pan. I created the rest of the body parts by forming rounded head and torso pieces using Reynold’s Release aluminum foil. Fold a long length of foil over on itself twice, so the finished width is about 3″ wide and 18″ long. Shape an oval head about 5″ across and a body about 6″ across and 8″ long. 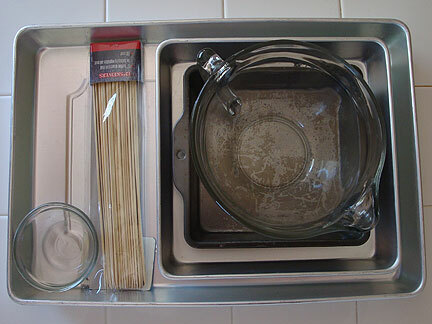 (See what fits in the pans you have and adjust accordingly.) Tuck ends inside the fold and set into baking pan. Pour in cake batter and bake immediately. A small amount of batter may leak out from under forms (let your kid just a early taste of their cake) but for the most part they bake up just fine. Assemble: Tuck wax paper under edges of sheet cake to protect paper while frosting the cake. Tint white frosting green and frost sheet cake. 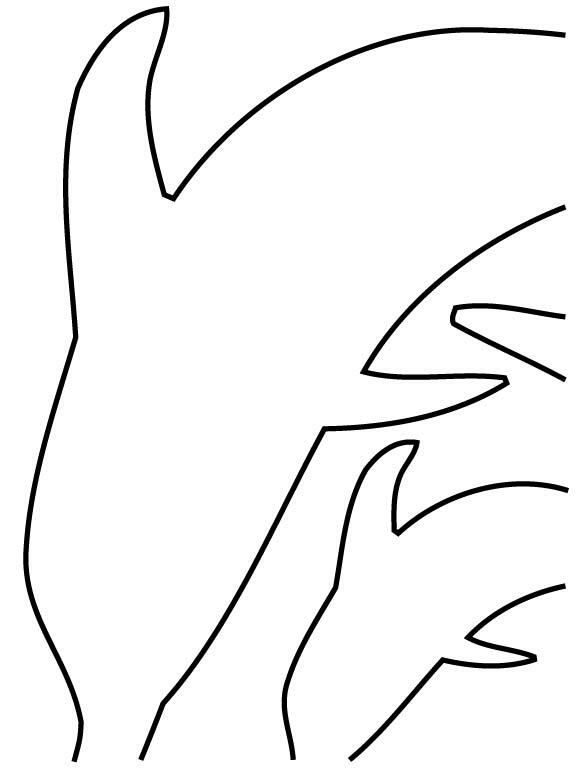 I added wavy lines all over the surface to resemble vines. Arms and Legs: To create the arms and legs, I cut lengths of 5″ long x 2″ wide cake at a diagonal about half way down the length, then switched the left and right end pieces to create the bend in the legs and arms. Gently cut the tail out with a small, sharp knife. Carefully assemble body parts on top of frosted sheet cake, trying to avoid getting too many crumbs on it. I cut a crescent out of the ear circles so they would fit up against the head snuggly. Frost: Make chocolate frosting, reserving some to add to white frosting later to create the lighter body and ear areas. Frost cake dark brown. Add lighter frosting to ears, face and torso. Add Junior Mints for eyes, caramel pieces rolled into nostrils and either black licorice string or black decorating gel for the smile and hand/feet details. For the finishing touch, I decorated around it with some jungle tree branches. You could also cut leaves out of construction paper. If you’re throwing a monkey themed party, consider giving the birthday girl or boy a monkey keepsake gift like this monkey memory box. Kyle Design has a great selection of monkey gifts – many of which make great party favors. Consider gifting monkey bookmarks or monkey magnets as unique party favors at your monkey themed party. This was a fun-filled birthday party for the 9-year-old daughter of friends that had 50 kids with many monkey themed activities. My husband and I helped with decorations and creating the games, but I’ve added some additional ideas here. Shop for Unique Monkey Gifts and Decor. 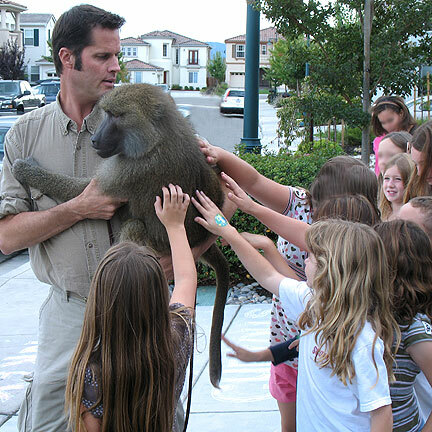 Kevin Keith from Monkey Business Productions working with the baboon at party for kids and adults. The kids learned a lot without being aware it was actually a lesson about primates. 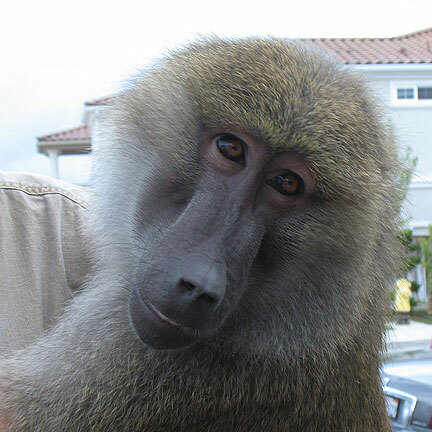 Monkey Business Productions based in Napa Valley, CA, gave the presentation which featured live baboons and birds – absolutely fantastic! Call Martina and Kevin Keith at 800-278-0002 if you’d like to have them perform at your party in the greater San Francisco Bay Area. Good looking, funny, fast-moving (both the humans and the primates). Very entertaining, informative and funny! 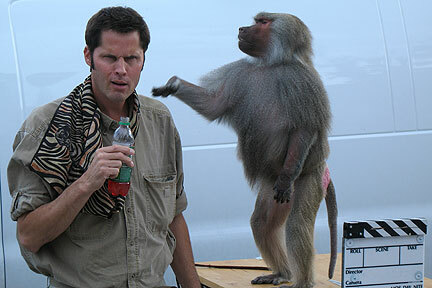 Kevin Keith with live baboon at monkey party. These animals have a lot of personality and are so much fun to watch. 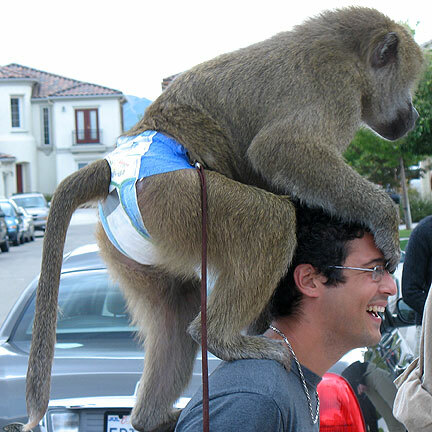 Baboon sitting on party guest’s head. They can kid around with the best of them. Warning – don’t try to out-entertain the entertainers. They are very talented and you will quickly become the punch line of the joke. Fast-faced entertaining game that was *very* different than any other party game you’ve played. Kids were all very into trying to win. 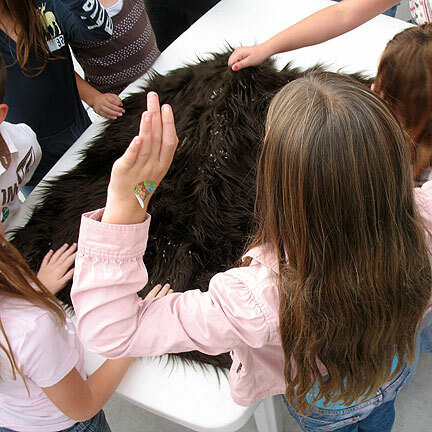 Buy a piece of fake fur fabric with long hair. Cut up into equal-sized sections (large enough for all kids to comfortable sit or stand around) with one for each group and place on construction tables or the floor. Toss a generous handful of rice across the fur. Set put a small bowl that the kids will use to fill with the rice (lice?) they collect. Give kids 2 minutes to collect as much rice as they can. Weigh with postal scale or measure results with measuring spoons if it is too close to eye-ball. Team with the most rice wins. 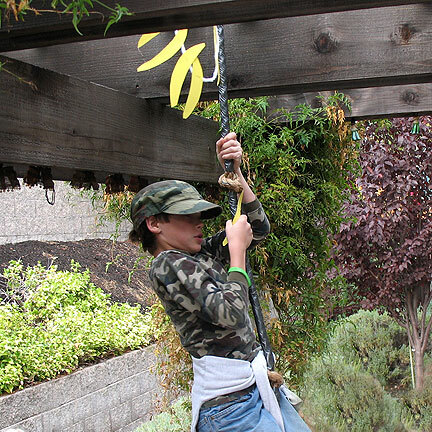 Tape yellow construction paper bananas to the top of an arbor. Tie ropes with knots tied about every 12″. Have teams race to climb up the rope, grab a banana, climb down and race to place banana in a basket. First team with 5 (or more, depending on the number of kids participating) bananas wins. Monkey party rope climber was trying to reach clue at the top of the ropes. Created “clues” from clip art and photos of primates and bananas. Use clip art from the Microsoft Clip Art Gallery. Place clip art pictures around the home and yards that have clues taped on the backside. Clues give a hint about the location of next clue. About 20 – 25 clues would be a good amount for this age group. We recommend putting up decoy pictures to mix things up, plus adding text clues such as Lemur when you have more than one lemur picture up on the walls. Adding text identifying each primate is educational without being obvious about it. Wear out the kids by alternating clues inside and outside, as well as upstairs and downstairs. Hide prizes for all the kids in a secret location for the final clue. Suggested hiding spots include a a basket in the pantry, bread drawer, inside the oven (tape over the knob with the word “stop” if using this hiding spot), or in the washing machine. Any of these can be good hiding place for prizes. The prizes were actually the party favor bags plus some squirt guns to play with as the party wound down. Barrel of Monkey Decorations: Accordion-fold a long length of plain wrapping paper into 3′ wide sections. Draw on a monkey with its tail touching the right edge and one of each of its hands touching a side. (See picture of yellow and red banner monkeys.) Cut out, being sure not to cut through the edges where the monkey is touching the edges. Unfold and draw eyes, mouth, nostrils, lines between fingers and ear details on each section. This creates a long connected chain of monkeys. Tape to walls, railings and across windows. String yellow and green colored streamers from the ceiling to look likevines. Covered table with green tablecloth. Add monkey-themed party supplies such as napkins, cups, and plates, plus plastic knives, spoons and forksin shades of green, brown or black. 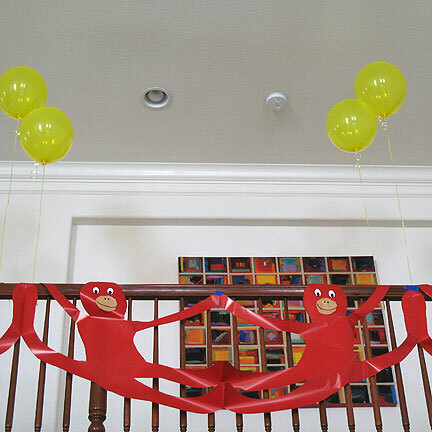 Use inflatable plastic monkeys from party supply store online and hang them from railings, chandeliers, doorknobs, etc. Although we helped with the games and decorations at this party we attended, the hostess just had a store-bought a birthday cake with plastic monkeys stuck on it. 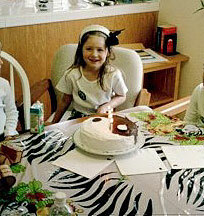 I decided to try making my own monkey cake later as shown at left. 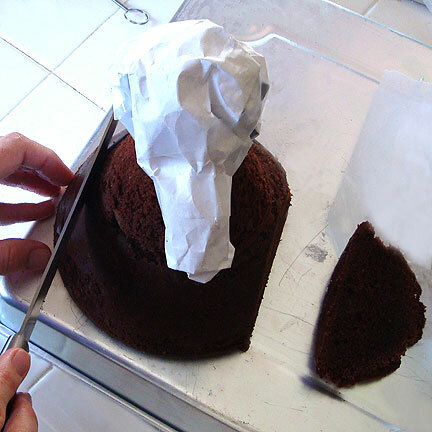 Monkey Cake: For cake making directions and pattern pieces, click on Monkey Cake Instructions. Monkey Pizzas: For a smaller group, have kids make their own monkeyface pizzas. Start with mini Boboli pizzas or use refrigerated pizza dough like they have at Trader Joe’s and pre-bake about 10 minutes. Have each child decorate their own monkey face with pizza sauce, pesto, cheese, pepperoni, veggies and any other favorite ingredients. Have the kids press their initials into the edge of the crust. Bake an additional 10 minutes and serve. Set out an example for them to get ideas to start. Use pizza sauce for the oval mouth or jowl area, pepperoni for the eyes, string cheese to create a smile, etc. Monkey Food: Set out bananas and other fruit around the party as decorations and quick snack food if the kids get hungry. 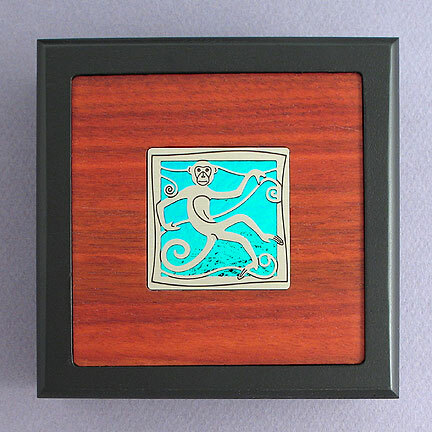 Create a special monkey keepsake with this personalized jewelry or keepsake box feautring a monkey and your choice of colored glass inlay. If you’d like to see our primate-themed gift and home furnishing ideas, go to Monkey Gifts and Decor or visit Creative Animal Gifts to shop unique gift ideas featuring wild and pet animals! Aztec Party with Sitting Dog Cake for Kyle’s daughter Kayden’s 9th birthday. August 2008. This was a fun-filled slumber party with many Aztec or dog themed activities based on the upcoming Disney movie Beverly Hills Chihuahua. Created a mural made from construction paper, markers, spray paint in shades of green and brown to create a quasi-jungle look. 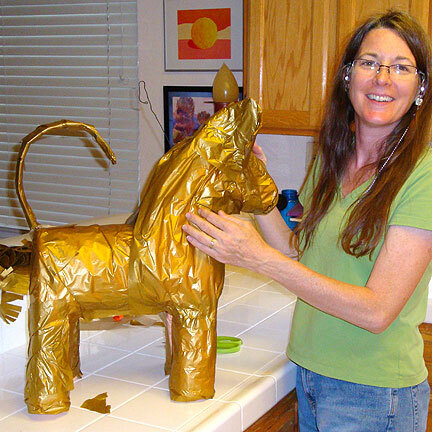 Started with a pink pony pinata, covered it with metallic tissue paper, then with fringe. 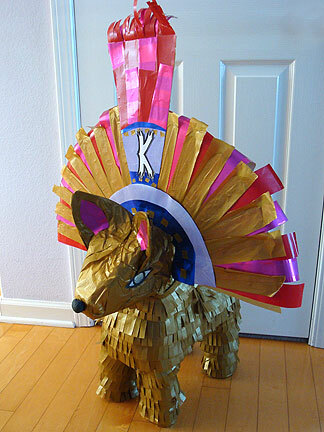 Added dramatic headdress made of metallic poster board, construction paper and wrapping paper. Basic Form: Started with a pink pony pinata from a local Mexican grocery store that has a great selection of unusual shapes. Convert to Dog: Covered the whole thing with metallic tissue paper, then covered it with fringe. I have a fringe making template that I got at the fabric store. Created a curved tail out of cardboard and a metal coat hanger, and taped on giant cardboard ears as well. Finishing Details: Kayden created a nose out of black tissue paper and a cotton ball. dded construction paper eyes. My other daughter then created a huge fancy headdress out of metallic poster board, construction paper and wrapping paper. 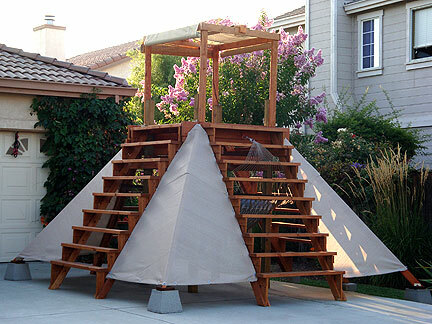 Mayan Pyramid Play Structure: My husband built a huge Mayan pyramid in our driveway for the kids to play on. I have always lamented that none of the trees on our property would ever be large enough for a tree house like I had as a child. My husband’s solution was to create the 14′ wide (at the base) and 11′ high stepped pyramid complete with hammock and solar lighting. It provides a great view of the neighborhood! Everyone’s favorite hang-out place now. Mayan temple play structure was big enough for all party guests to play on it at the same time. 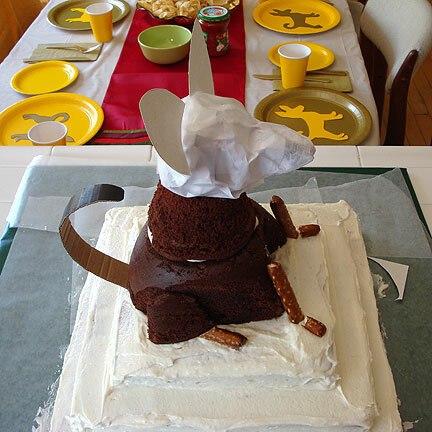 Warrior Dog Birthday Cake: Created a dog cake with a Chihuahua sitting on top of a three-layer pyramid temple. The kids loved it! Visit Chihuahua Cake Directions for step by step instructions on how to make this unique dog birthday cake. 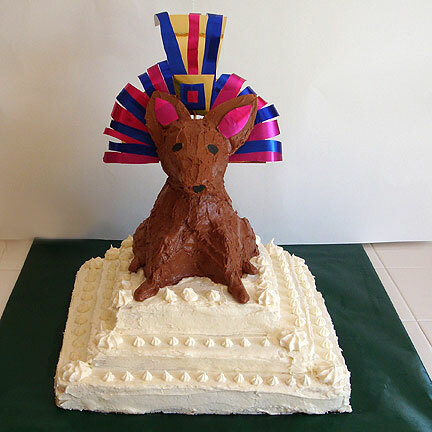 Warrior Dog: Created a dog cake with a Chihuahua sitting on top of a 3 layer pyramid temple. Directions: For cake-making directions and step-by-step photo guide, click on Dog Cake Instructions. Party Favors: Used the Chihuahua dog necklaces with inexpensive collar necklaces from Dollar Tree. 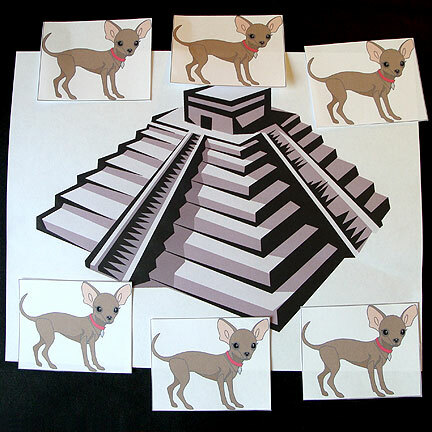 Treasure Hunt Clues: Print out photos of dogs, Aztec temples and Mayan pyramids to hide. Creating the Clues: Created “clues” from clip art and photos of Mayan temples, Aztec pyramids, and Chihuahuas. I use clip art from the Microsoft Clip Art Gallery. In addition, I found some very funny Chihuahua pictures on Google Images. 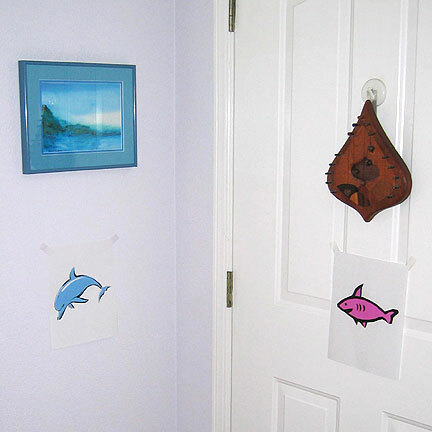 Hiding Clues: Place clip art pictures around the house and yard that hold clues on the back. Clues indicate location of next clue. We had about a dozen clues for this age group. 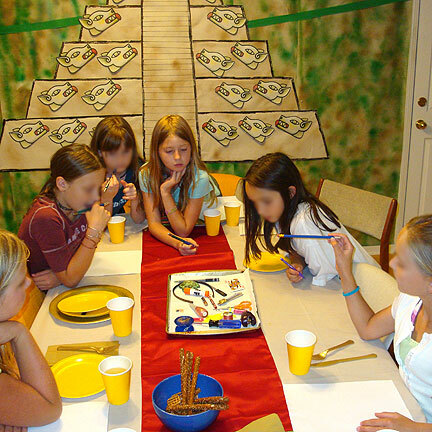 Be sure to put out decoy pictures as well to mix things up or add text clues such as Pyramid when you have more than one temple picture up on the walls. Wear out the kids by alternating clues inside and outside, upstairs and downstairs. Treasure at the End: Hide prizes for all the kids in the final location – we used the furnace closet this time, but a bread drawer or dryer are also a good hiding places for prizes. We stashed the party favor bags that had Silly Putty, gum and small toys the children could play with until the parents arrived. The girls playing the Memory Game at the table decorated with golden paper plates, golden flatware, red table runner. Memory Game: Lay out a tray of 25 common household items. Give each kid a piece of paper and pencil. Give the kids 2 minutes to look a the items, then cover them up and take the tray away. Allow the kids another 3 minutes to write down everything they can remember. Winner received a prize. (We actually had a tie and so had to let the the two girls battle it out with another 30 seconds for viewing and 1 minute for writing them down.) Big Hit! Tape the Chihuahua on the Temple Top: Variation of Pin the Tail on the Donkey. Printed out 8 little pictures of Chihuahuas and a larger temple for the wall. Cover their eyes with a hand towel with extra folded up small soft towel or wash cloth over the eyes to eliminate any temptation of peaking. Spin the girls around 3 or 4 times and point them in the right direction. Prize goes to the one whose Chihuahua dog is closest to the top. 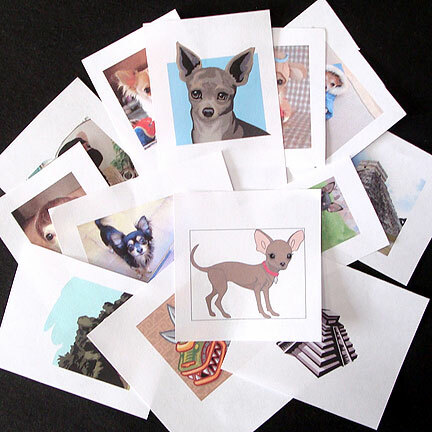 Variation of Pin the Tail on the Donkey game with little pictures of Chihuahuas and a larger temple. The girls couldn’t bring themselves to destroy the golden chihuahua, so we quickly converted a hula girl pinata with blue warrior paint. 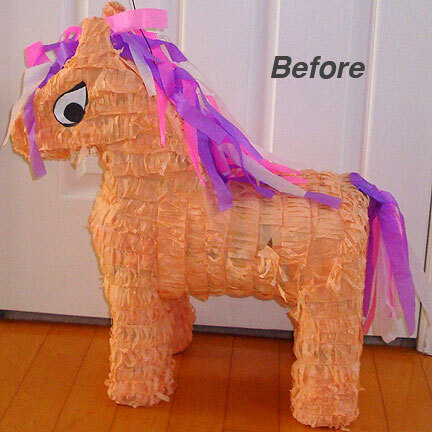 That ugly pink pony pinata that we started with – it had potential…. America’s Next Top Chihuahua Model: Starting the transformation using gold metallic tissue paper, cardboard ears and tail. 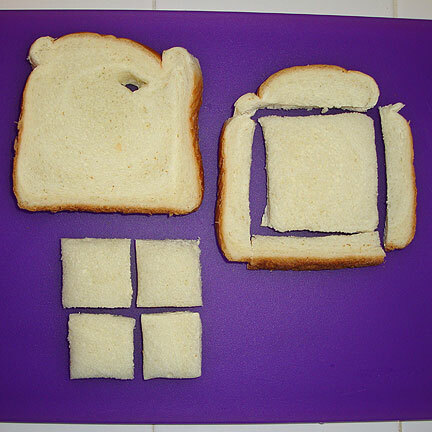 Cut Up Texas Toast for Pyramid: How to cut up the Texas Toast into three sizes of squares. 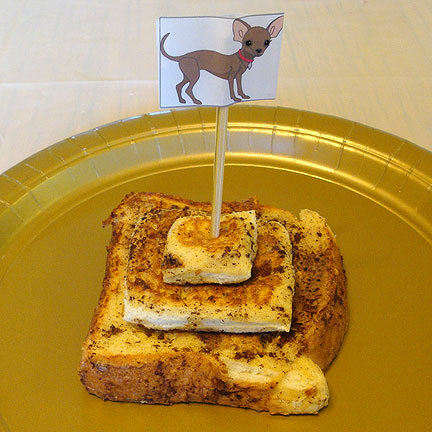 Golden Aztec Temple French Toast – three layers of fried Texas toast held together with a chihuahua-topped bamboo skewer. Make Your Own Pizzas Using bread dough such as the refrigerated kind from Trader Joe’s, which is available in both white and whole wheat versions. Roll out into circles, then pre-cook for 10 minutes. Have each child decorate their dough with pizza sauce, pesto, cheese, pepperoni, ham, pineapple and any other favorite ingredients. Bake an additional 5-10 minutes and serve. Mayan Temple French Toast: Created 3-layer temples of golden French toast. First layer is one piece of Texas Toast. Layer two has the rinds cut off. For layer three, cut off rinds then cut remaining piece into 4 squares. Dip and fry separately. Assemble in a stack, hold together with chihuahua-topped skewer and sprinkle with powdered sugar. Skewer with a strawberry if desired. Serve with syrup that will pour down the side. Drinks: Served apple juice and sparkling water so kids could mix their own “sodas”. Create golden chihuahua plates by cutting out dog shape from alternating colors of yellow and gold plates and gluing together. 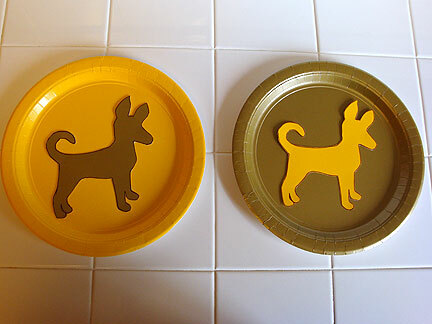 Chihuahua Plates: Bought gold and yellow plates, then cut out chihuahua puppy dog shapes from one color and glued onto contrasting colored plate. Streamers: Strung gold, blue and green colored streamers from the ceiling. Table Decor: Covered table with temple-colored (neutral) tablecloth. Added red and gold party supplies such as cups, napkins, plates and flatware. Transform Your Chairs: Covered chairs with gold felt. Inexpensive felt yardage is available at fabric stores. 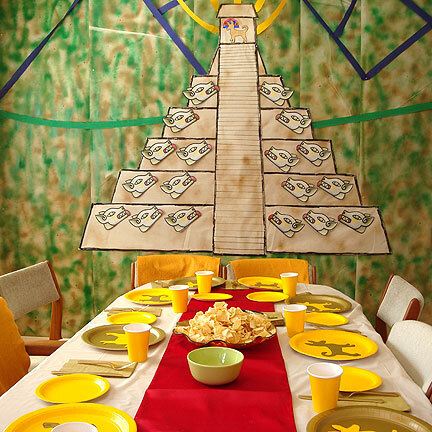 Wall Mural: Decorated the kitchen walls with Kraft paper on which we drew a giant Mayan temple covered with Mayan Dog heads. Spray-painted paper with shades of green and brown to create a quasi-jungle look. 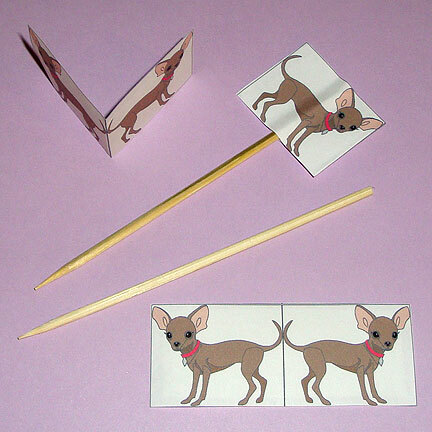 Made simple chihuahua dog skewers with paper photos of dogs on a long strip of paper. Fold over and attach with double-stick tape. Created this cute and unique 3-D seated Chihuahua dog on a 3 layer birthday sheet cake pyramid for my daughter’s 9th birthday Aztec Chihuahua Party. Used both chocolate and vanilla cake recipes so kids would have their choice of flavors. Be sure to check our all of our cute Chihuahua Gift Ideas, too! Chihuahua Dog Cake Baking Pans: Baking pans used for creating Chihuahua dog cake: 12″ baking pan, 10″ square sheet cake, 8″ cake pan, 2 quart Pyrex mixing bowl (dog torso) and small Pyrex cruet (dog neck). Vanilla Layers: Lined all sheet cake pans with parchment paper. Made two triple layer vanilla cake recipes from the Soft as Silk cake flour box. Divided them between one 12″ square sheet cake pan (or a 12″ x 18″ pan and trim it down after baking) and one 8″ square baking pan. Cut out semi-circle from front edge of chocolate cake to create recessed chest area of the chihuahua dog. Made one triple layer Devil’s Food Chocolate cake recipe from side of cake flour box and divided it between one 10″ square sheet cake (for center layer), one 2 quart Pyrex mixing bowl (dog torso) and one small Pyrex cruet (dog neck). 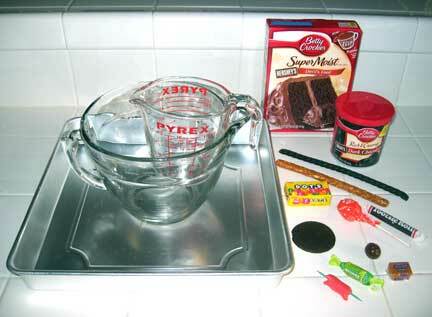 Note that Pyrex mixing bowl had to bake about an extra 20 minutes – touch center to test if it springs back to indicate it’s done. Let cool and remove from pans according to directions. Place on a large wrapping paper covered piece of cardboard. Tuck pieces of wax paper just under the edges that can be removed when done frosting the cake. Trim sides of larger form about 1″ off each side. Split one of the trimmings in half vertically, placing one slightly back on each side of dog torso to create haunches. Seated Dog: To create the warrior dog sitting on top of pyramid layers, cut out semi-circle from front edge to create recessed chest area. Trim sides of larger form about 1″ off each side. Split one of the trimmings in half vertically, placing one slightly back on each side of dog torso to create haunches. Discard (or eat) remaining trimmings. Use pretzel logs to add legs and paws. Add small cruet to top of torso, securing with frosting. Alternate chocolate and vanilla layers and add frosting in between. Mount dog on top. Frost with chocolate frosting. Paper Head: Wad up paper in the shape of a dog head. Tape to hold form. Tape on two large ears cut from card stock. 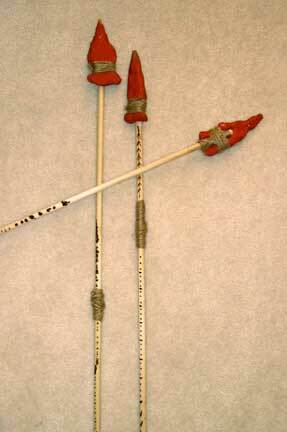 Use two bamboo skewers to poke into bottom of head, then push into neck and torso cake forms to mount. This also helps to hold the whole cake together. Shape dog head out of paper. Add two large ears cut from card stock. Add pretzel stick legs, thin curled cardboard tail. 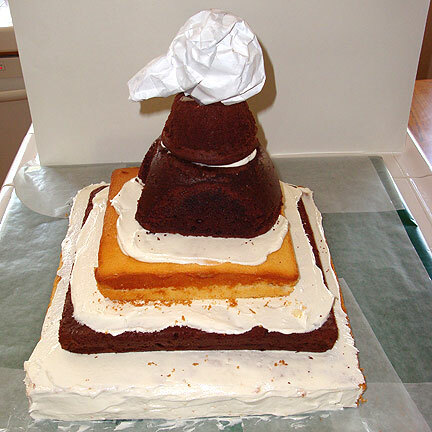 Frost: Make buttercream frosting recipe and frost everything – white for pyramid, chocolate for dog – including the paper head and ears. Trims: Decorate with black gel or black construction paper to create eyes and nose. Create headdress from card stock on bamboo skewer, decorating with wrapping paper, construction paper, scrapbooking sheets, ribbon or whatever other colorful trims you have around. Finishing Touches: I decorated the edges of the temple with florets of frosting using a pastry bag, but you could use a plastic bag trimmed off at the corner. 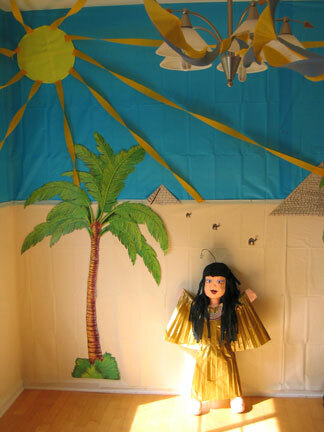 This was an Egyptian slumber party with lots of blue and metallic gold decorations, mummy games and a giant pyramid tent that all the girls slept in. 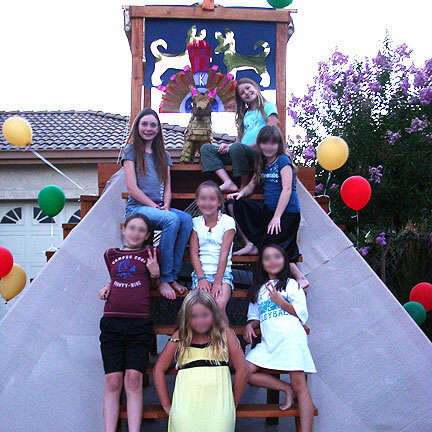 Egyptian Party with Giant Gingerbread Pyramid Cake for Kayden’s 7th. April 2006. 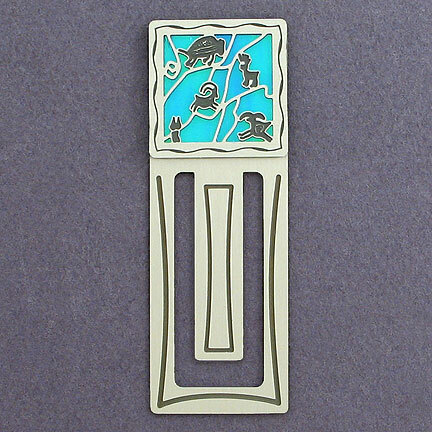 Check our our Unique Egyptian Gift & Décor Ideas below. My husband took 10′ wood curtain rods and drilled a hole in each near the end, then tied together with rope. I sewed up 2 cotton drop cloths (9′ x 12′) into a cover, leaving one seam half open for an entrance. Decorated entrance with blow-up palm trees. We put foam mats across the floor of it, threw blankets over them and called it a day. 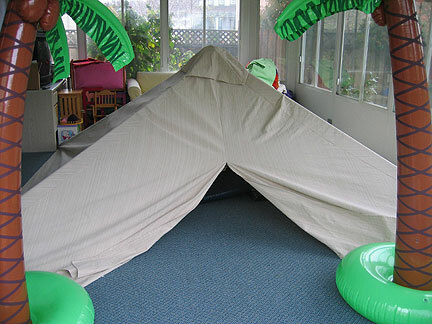 The kids loved sleeping in the pyramid that night! All the kids decorated a gingerbread pyramid cake using candy and chocolate, although I stayed in charge of applying the royal frosting. 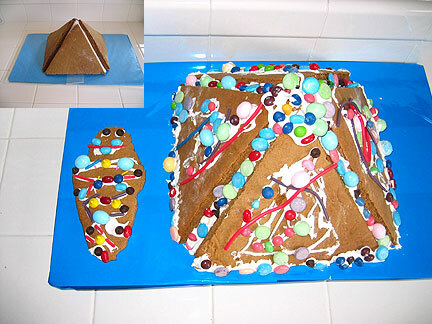 Bake gingerbread in 2 sheet pans, then cut into 4 equilateral triangles with 9.5″ sides. Cut a paper pattern first. Glue these gingerbread triangles onto a cardboard pyramid form with royal icing. Set out trays of hard candy – jelly beans, mini M&Ms, bottle caps, Twizzler Pull-n-Peels, etc., and let the kids go to town on the cake! Created a 7″ mummy cookie cutter using tin and scissors. Cut out gingerbread mummies for the kids to decorate and eat when the party was just starting. Used the same candy as for giant pyramid. That’s the mummy cookie on the left. Fancy! 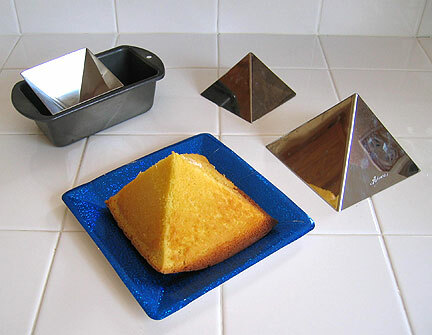 Set the pyramid pans into small baking pans or glass Pyrex measuring cups to bake. The child that picked the cake with the M&M received a prize. 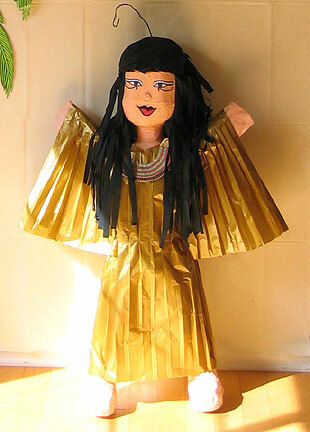 To create the golden Isis Pinata, I started with a Hula Girl pinata and converted her using gold metallic tissue paper (available from http://www.nashvillewraps.com). Downloaded photo of beaded necklace to cut out and decorate the pinata. Used gold and blue streamers, metallic gold table cloth with metallic blue cups and plates. Covered chairs with blue and gold felt. Mummy cookies laid out on stunning royal blue mosaic serving platter by Susan Walker. 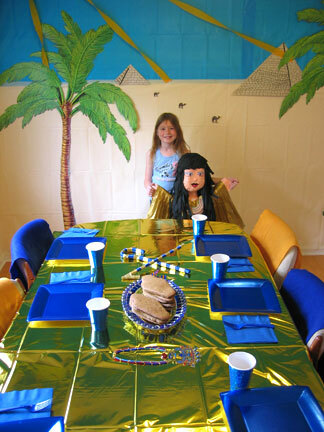 Decorated wall with turquoise and cream colored plastic table cloths and paper palm trees. Drew paper pyramids and used camel clip art for the finishing touches. 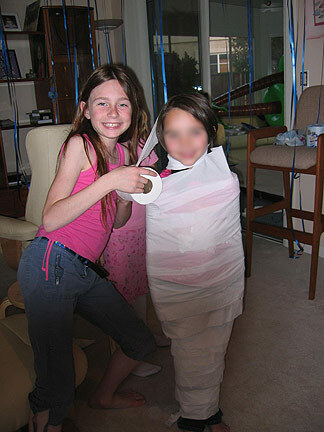 Teams of two kids take turns wrapping the other with toilet paper. First team with a completely wrapped up partner wins. Big Hit! Created “clues” from clip art and hieroglyphs. Provided a Rosetta stone key that the kids used to decode the hieroglyphs to read the clue. I use clip art from the Microsoft Clip Art Gallery. Clip art pictures placed around the house that held clues on the back. Be sure to put out decoy pictures as well to mix things up. Hide prizes for all the kids in the final location – we used the washing machine. Used King Tut clip art and made copies of his beard for the kids to try to place in the correct spot. Poor Tut!! 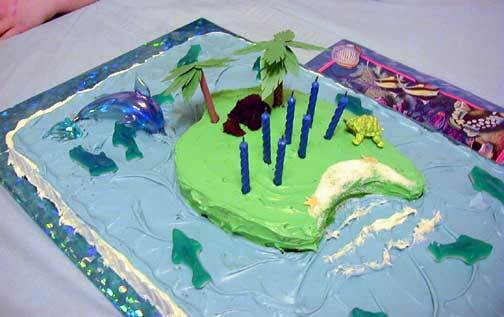 Island of the Blue Dolphin Cake for Parker’s 7th. March 2003. Bake one round cake layer. 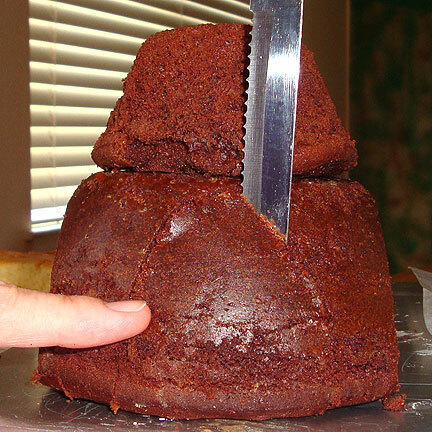 Cut round cake into shape of island; put on top of sheet cake. To fluffy white frosting, add blue food coloring to create water and green coloring to create the island greenery. I added gummy sharks and small blown glass dolphins to the water, and a turtle to the island. I made palm trees out of toothpicks and brown and green construction paper. Draw on some details (coconuts, slash marks, leaves) with green and brown markers. Make whitecaps in the water and the beach with white sugar. Make boulders out of left over cake that was cut away. 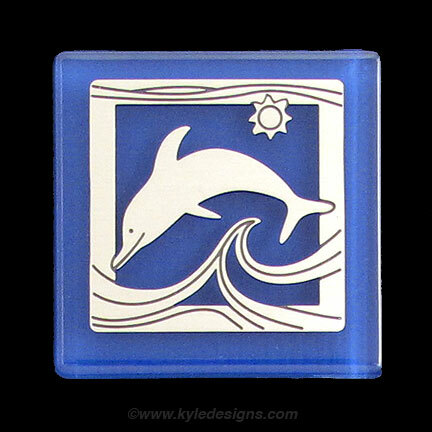 Unique party favors with dolphins – these handcrafted dolphin magnets come in 20 different colors and will be a hit at any ocean themed birthday party. Created these cute 3-D jumping dolphins on a sheet cake for my daughter’s Ocean Party for her 8th birthday. Used both chocolate and vanilla cake recipes so kids would have their choice of flavors. The kids especially liked the hard sugar sea creatures used as accents. Bottom Layer: Bake one 12″ x 18″ sheet cake in chocolate using a double cake recipe. Let cool and remove from pan according to directions. Place on a large wrapping paper covered piece of cardboard. Tuck pieces of wax paper just under the edges that can be removed when done frosting the cake. 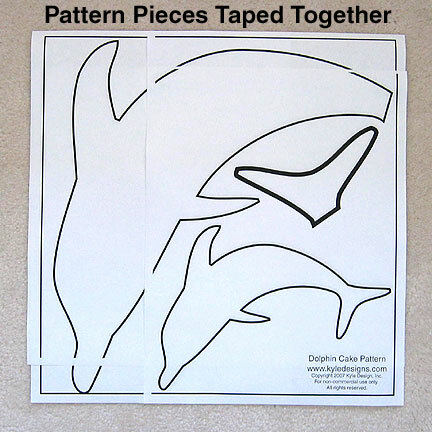 Raised Dolphins: To create the raised dolphins, copy and print out the 4 pieces of dolphin cake patterns shown here. (Click photo to enlarge, copy, past into Accessories > Paint program, print.) Tape together to create a 12″ square. Foil Patterns: Using long pieces of Reynold’s Release aluminum foil, fold over three times to create stiff guides 8 layers thick. 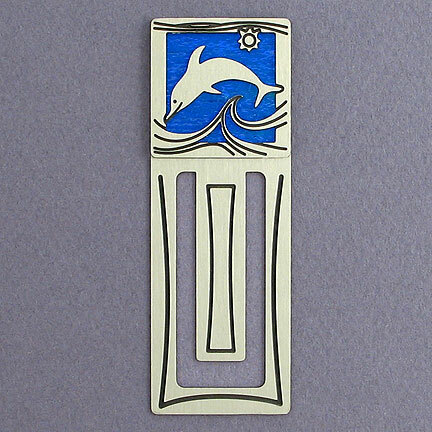 Bend the foil strips to match the dolphin cake patterns. Place in a 12″ square cake pan that has been greased and floured (use parchment paper, too, if you have it). 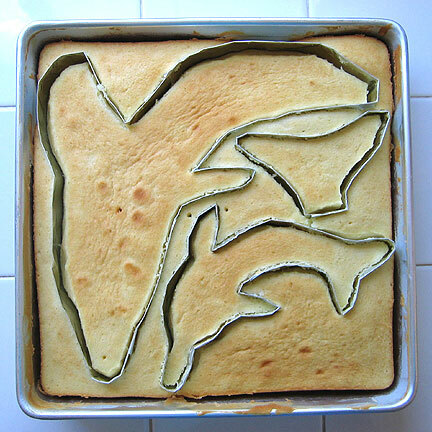 Batter: Pour in cake batter (1-1/2 recipe) in and around dolphin patterns. Bake. Cake will pull away from foil patterns slightly. 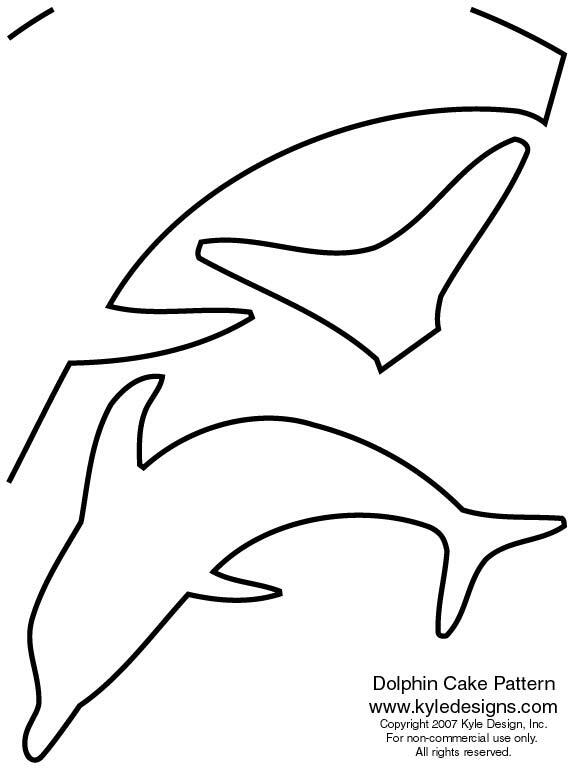 Assembling the Dolphins: Remove extra cake from around outside edges of dolphins. 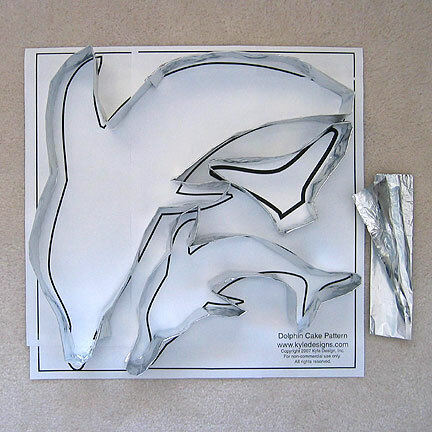 Gently remove dolphins and set on top of frosted bottom layer, assembling large dolphin body and tail. Frost. Add M&M eyes. Finishing Touches: Make whitecaps in the water with white sugar. Add hard sugar sea animals along edges and in open ocean areas for added color. 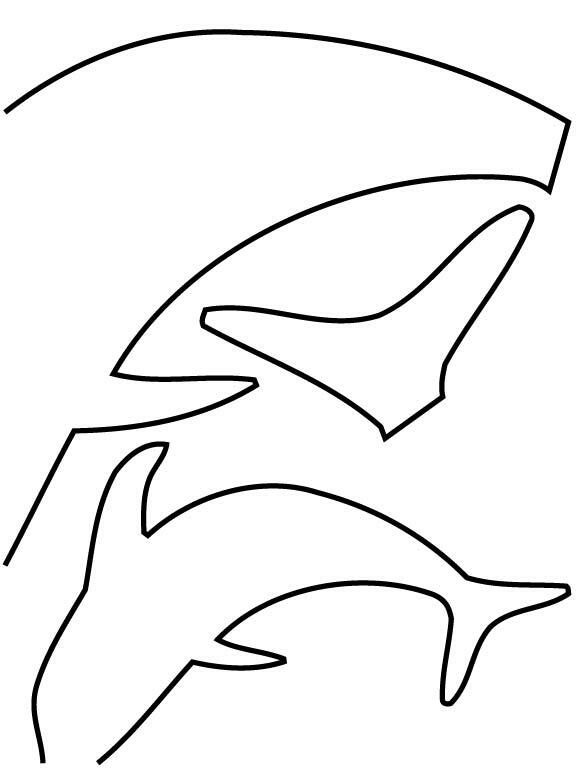 Print and tape together to create the pattern for your home-made dolphin cake. Cave Cake for Parker’s 9th. April 2005. In addition to the Cave Cake with a pig roasting over fire, we had the kids decorate cookies that I cut out in the shape of deer. For the meal, we had the kids make create-your-own shish kabobs. Grilled cheese spears: Assemble grilled cheese sandwiches and broil or pan grill. Then trim crusts, cut on the diagonal and wedge a thin bread stick into one side of each wedge. Display in a tall cup. 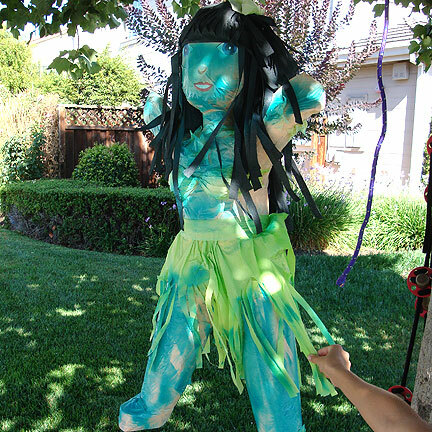 To create a Cave Girl or Cavewoman pinata, I started with a hula girl pinata as a base, stripped off all signs of hula skirt and flowers, then used animal print tissue paper to create a new skirt and bra. I decorated it with animal print jewelry, such as necklaces, earrings or bracelets. 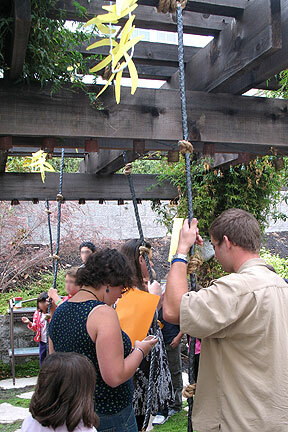 Just take a photo of bones, animals or cave drawings, and either tape onto a thin piece of cardboard and cut out or just tape the paper right onto the pinata. I bought two yards of several different types of fake fur fabric that we threw over foam maps on the floor. My husband covered the walls of the “cave” with brown craft paper then drew on cracks, rock art and wild animals. For the party, I also made very simple animal print cave girl dresses tied over one shoulder for all the girls. 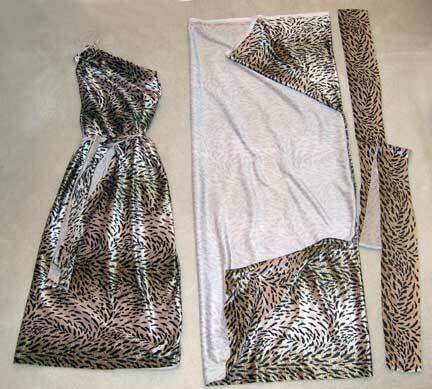 To make a dress, you’ll need a 1-1/2 yard x 45″ wide piece of animal print fabric – knit fabric is best. Put selvage edges together. Measure down 18″ from the top, start sewing seam and stitch for 24″, then stop. (If you don’t have a sewing machine, you can easily hand-stitch it with just a needle and thread. Or for a really quick and dirty job, just staple it together.) See photo. Top corner edges become ties for the top of the dress; bottom open area is kick area for bottom of dress. You can cut a zig-zag pattern along the bottom of the dress, if desired. Just be sure to mark off even distances, say every 3″, for the top of the zags. If fabric is wider, or the girls are thin, you can also cut off about 3″ along one selvage edge to create a belt (3″ x 45″). For a caveman costume, don’t belt the costume, or just make it shorter, leaving ties at the waist to secure it. Stitch a 24″ long seam on side edge (staple if in a hurry – perfect if you can’t sew), then stop. Activities included spear making using Sculpey clay, twine, wood dowels and a wood burning tool; a slingshot contest; roasting marshmallows over a camp fire; and a treasure hunt for breakfast (hidden bagels) using paper clues. For the petroglyphs and cave drawings, as well as clues for the treasure hunt, I used clip art from Microsoft Clip Art Gallery. Needed: Cake baking pans, cake mix, frosting and decorating accessories. Bake two cakes, one a 15″ square, the other in a a deep Pyrex mixing bowl (mine is from Pampered Chef) with a 2-cup Pyrex measuring cup hooked over edge of bowl to create the “cave”. Cake decorations include a roast pig on spit (pink Tootsie Roll molded into pig shape with toothpick poked through), orange Dot gum drop candies cut into small pieces to create glowing embers under pig, chocolate cookie wafers for ashes under pig. Also, large pretzel sticks for either side of cave opening; malt balls, caramels and Tootsie roll bits rolled up to resemble rocks and boulders; Tootsie Pops with green Tootsie Roll leaves; black licorice trim; candy corn for fire inside cave. 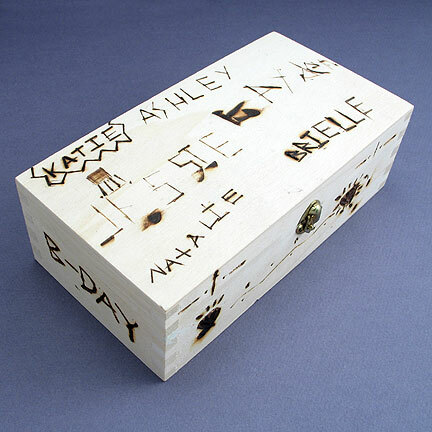 Party Craft Activity: Use wood burning tool to decorate box for birthday girl with messages from all guests. 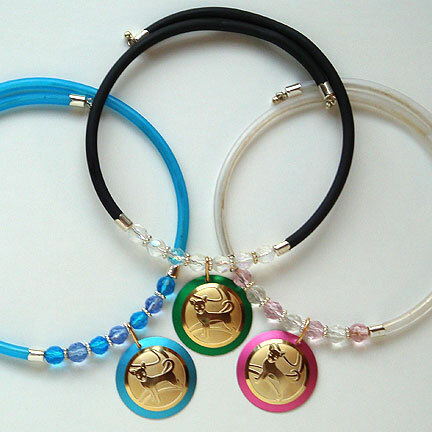 This is a great keepsake for any birthday girl or boy. 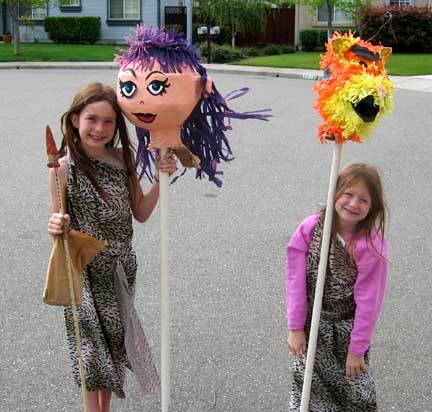 Kids dressed in cavegirl costumes with Pinata heads. Kids went home with Rock Art Bookmarks from Kyle Design – each with a different color.